A lot of people are quick to write-off Ho Chi Minh City’s Chinatown. Why would I go to Chinatown in Vietnam? Those same people are probably staying in the backpacker district. In Vietnamese, this area is called Khu Tây Balô, which basically means Westerner Backpack District. It’s the equivalent to Chinatown but for backpacking westerners. In Vietnamese, the Chinatown area is called Cho Lon, which means great market. 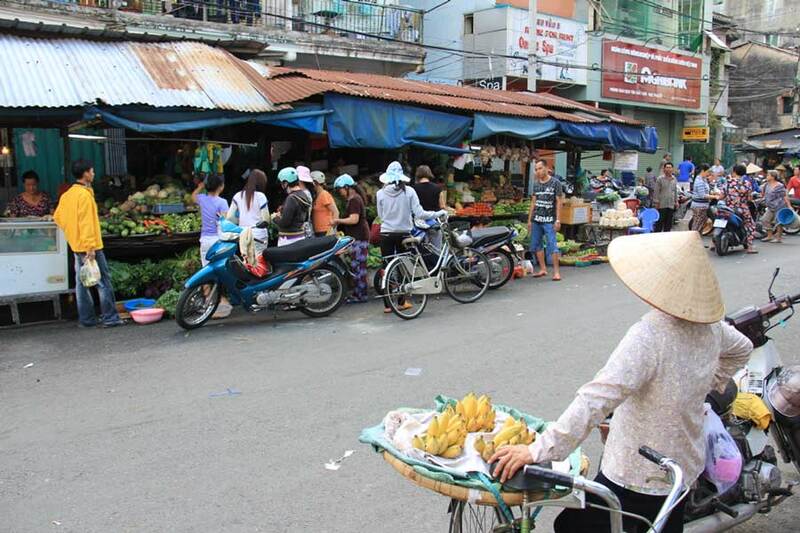 This is because it’s the home to the largest market in Saigon, Binh Tay. Cho Lon sort of straddles district 5 and 6. It was once its own city, settled by the Hoa people in 1778. Eventually, Saigon expanded and the two cities merged. I seriously love Ho Chi Minh City’s Chinatown, so I hope you take the time to visit it, and I hope this walking tour helps you appreciate this unique area of Saigon. A mobile banana vendor on the streets of Saigon. This self-guided walking tour covers the main tourist attractions in Saigon. The actual walking time is only about 90 minutes, but it should take you the better part of a day with the all the stops. There are 4 meals on the tour, as well as plenty of opportunities for coffee breaks. Saigon is hot and the sidewalks are broken, cluttered, or non-existent. Be careful and take breaks regularly, especially if you are doing this in the hotter times of the year (March-June). Wenshu Monastery (文殊院 – Wen Shu Yuan) is the best preserved ancient monastery in Chengdu. It’s the home to 80 monks, and is frequently visited by both tourists and locals. The locals come to relax in the gardens, sip tea at the tea house, or worship at one of the many sacred halls. Tourist often come for the amazing stone and wood architecture, or to peruse the art and relics that can be found throughout the grounds. Wenshu monastery is a great way to spend a couple hours if you are in Chengdu. Don’t let the overly wordy title scare you. The Garzê Tibetan Autonomous Prefecture, may sound like a medical injury, but it’s actually an invigorating place. It is an area in western Sichuan that is mainly inhabited by Tibetans. An autonomous prefecture is a territory in China that has a population of 50% or more ethnic minorities. In Garze, there are around 880,000 people and around 78% of them are Tibetan. When my bus rolled into Kangding, the capital of the Garze region, it felt like I had entered another country. This isn’t your typical China. The Tibetan culture is here, which makes it a great alternative to traveling Tibet. Chengdu is a shopper’s paradise. Malls seem to be popping up weekly across the city. There are plenty of shopping streets and specific product shopping areas. Of course, that means plenty of opportunities to buy souvenirs, but if you’re looking for something truly unique Chengdu’s Art and Antique Market is the place to go. Song Xian Qiao (送仙桥古玩市场) not only has cool gifts, but it’s also an amazing experience. These are my favorite dishes from Vietnam, and the ones I crave most after living there for 2 years. If you’re headed to Ho Chi Minh City/Saigon, I’ve also included the best places to try these unique and wonderful meals. Directly to the east of the Sichuan Gymnasium metro stop is a short stretch of road that is a haven for electronic shoppers. While ‘Computer City’ is the name of just one of the many giant electronic department stores (likely the first one) on the street, the block itself is often referred to as Computer City. It’s the place to go for electronic shopping in Chengdu. If you’re looking for a computer, camera, tablet, speakers, smartphone, security device, office furniture, or almost any type of electronic accessory – there’s probably a vendor in Computer City that has what you’re looking for. The Wide and Narrow Alleys of Chengdu: Preservation or Profitization? The Wide-Narrow Alleys (Kuanzhai Xiangzi – 宽窄巷子) are a set of lanes that have been preserved by the local government in Chengdu. About 60% of the buildings have been rebuilt, and 40% were renovated in their original architectural style. The rebuilt buildings took some liberties, adding some touches that would help them be more commercially appealing – for example, French style windows. This gives the alleys a feeling that I would describe as chic-ancient. Nonetheless, they’re a very popular tourist destination in Chengdu. As the sun comes down, people swarm the streets to shop and eat. They’re not there for the historic value. If they are, they’ll be walking away disappointed.